Anna Tereza žije v Ugandě, o které se na našich stránkách můžete také něco dočíst. Ve fotogalerii Vám chceme představit Annu Terezu na několika fotografiích a můžete nahlédnout i do jejího vysvědčení apod. Uganda je prezidentská republika, nacházející se ve východní Africe, která hraničí s Keňou na východě, se Jižním Súdánem na severu, s Demokratickou republikou Kongo na západě, se Rwandou na jihozápadě a s Tanzanií na jihu. Součástí Ugandy je i nezanedbatelná část Viktoriina jezera, kterým také procházejí hranice s Keňou a Tanzanií. 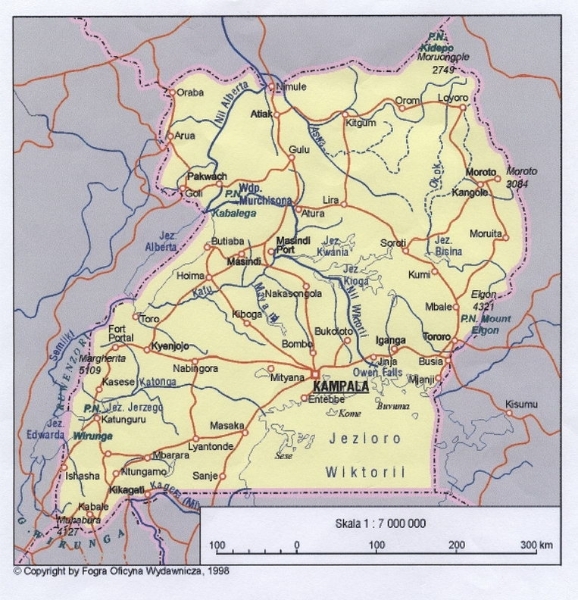 Uganda má rozlohu 236 040 km² a žije tu 30 milionů lidí (2007). 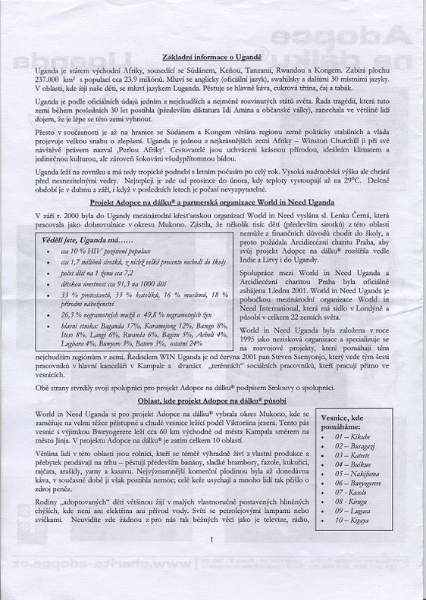 Název Ugandy je odvozen z názvu tradičního království Buganda, jehož součástí je jižní část země včetně hlavního města Kampaly. Anna Tereza nám poslala opět milý dopis včetně své aktuální fotografie a posledního vysvědčení. 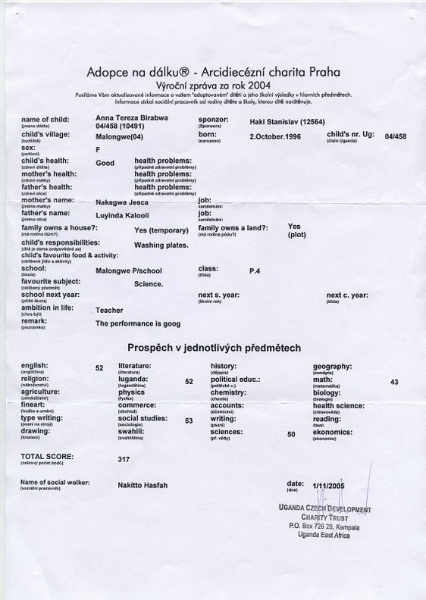 Předchozí dopisy a informace o průběhu adopce najdete níže na této stránce. I am your dcera Anna Tereza from Uganda. I am very delighted for your nice letter and many pictures you drew for me. I will keep them and show to my friends at school. I am O.K. with life and the sudies are going well. Thank you very much for helping me on my education. Apart from school fees I got a new mosquito net. I sleep well at night. I wish you all lovely summer holidays. I do some sports like net ball, athletics and I sing. As the Christmas is soon approaching. For us we celebrate this day on 25th December, so I wish you all a happy Christmas day and a prosperous 2006 year. Thank you very much for thinking of me praying for me and your help which means so much to me. How are you all? My life is O.K. and I am doing well at school. We are at school now and the studies are moving well. What about you in your country? Is it still winter season? How are the teachers of 8 class and pupils of 9B class? As the easter time is coming let me use this chance and send greetings for Easter day, so I wish you all much happiness, good health and be satisfied on Easter day. Best regards from Birabwa Anna Tereza. I am your lovely daughter Anna from Uganda. I was very surprised for all the letters you wrote to me plus nice drawings which you all drew for me. Really you all are good artists. When I recieve letters from you my heart bumps. You wanted to know my favourite food and subject. My favourite subject is English and my favourite food is rice and meat. My life is good and healthy. I like studies so much. Our new school year starts in February. My favourite singer is Peter Ceters. I play the drums and I am good at it. I have got many friends and my best friends are Racheal and Sarah. Life in Uganda is not so good because most of people are very poor and those who are rich are very small in numer. 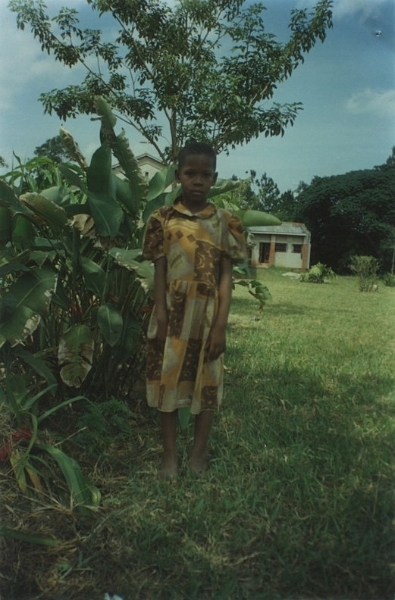 Like in our village many children are orphans. Their parents died of AIDS. Some are very poor, they dig in villages to get what to eat . Those who live in big towns they have good life. 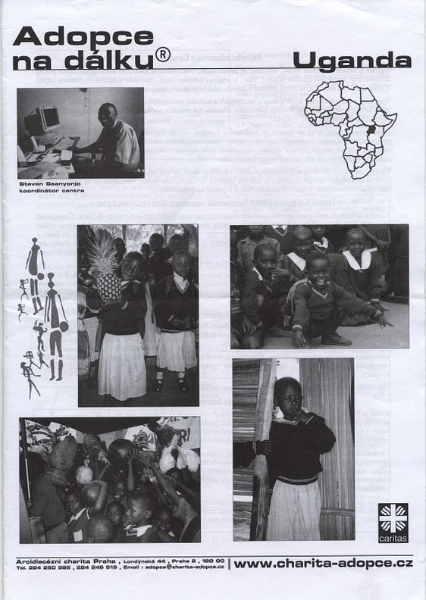 So that´s how people live in Uganda. In my country people are preparing for Christmas season. With love and prayers from Anna Tereza. How are you all? I come back from summer holidays. We also had two weeks holiday and now we are back at school for the last term. This term is the one which determines wether you pass or repeat that class and I am sure that I have to pass to another class next year. Thank you very much for your great adoption towards me. I am proud of you. Have nice days and much Access in studies. Many greetings and love from Tereza. I was very pleased to recieve your letter for the first time with dates 6 April 2004. Thank you very much for introducing to me each and everything about your teacher Mr Hakl and your country. It was very interesting to read that. We had three weeks holiday in our country and now we are back at school. I was so excited for the nice picture you drew for me. From your support I have bought a new pair of shoes and stockings. I am very happy now because I look smart on my way to school and I am out of sharp stones . Many greeting from me, my granny and my social worker Miss Hasfah. 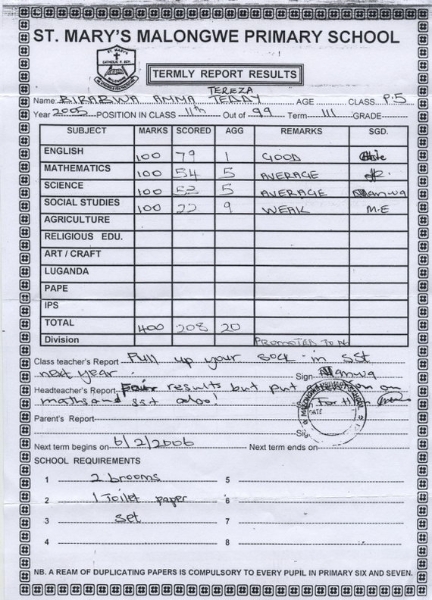 I am called Anna Tereza Birabwa from far away Uganda which is found in East Africa. Thank you very much for paying my school fees plus other gifts such as blanket bed sheets, pillow and clothes. I am very happy because I sleep well and I am no longer cold at night. May God bless you and your work. In Uganda we have two main seasons sunny and rainy. But we recieve rainfall through out the year with a plenty of good sunshine. And now it is sunny weather. I wish you good health and protection of God at Easter day. Many greetings from your new dcera Anna Tereza Birabwa. 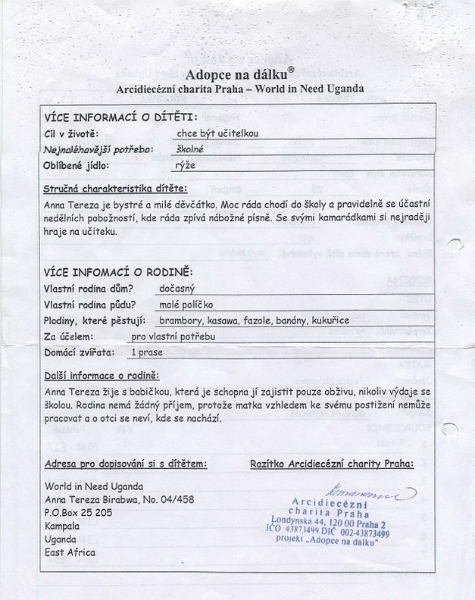 I am your new adoptive dcera Anna Tereza from Uganda. I am very happy that I can communicate to you this time. Thank you very much for choosing me from the very many children who are looking for help. Thank you very much having that generous heart. 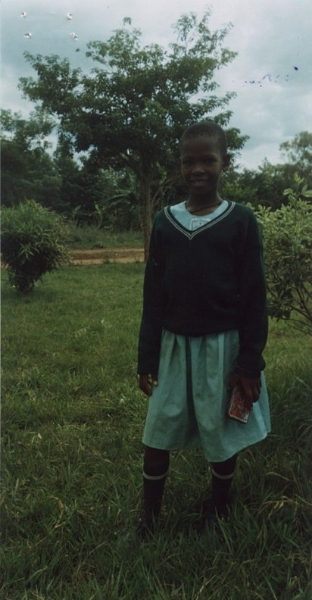 I am in primary four class now at Malongwe primary school. My favourite subject is science and I want to become a teacher after my studies. I am going to work harder so that I achieve my goal. I also like singing and playing with ( puppets) dolls made from banana. I stay with my granny and she is also so happy for you. I thank God that you have decided to help me on my studies. 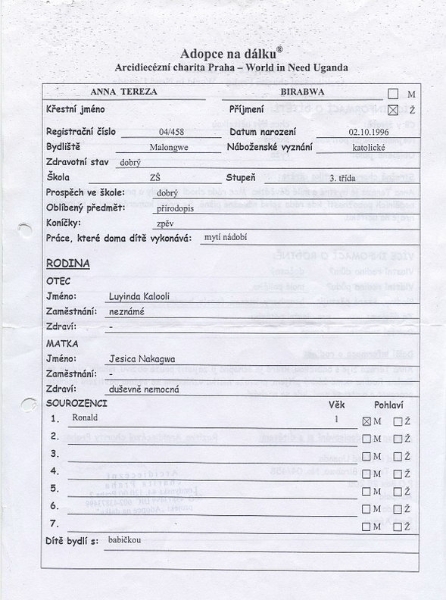 I had no hope of getting a sponsor from abroad..
Love from your new adoptive dcera Anna Tereza Birabwa.